A parliamentary report of 1777 recorded parish workhouses in operation at Abinger (for up to 30 inmates), Dorking (80), Effingham (6 families), Ockley (25), and Wootton (25). County of Surrey: Abinger (2), Capel (2), Dorking (4), Effingham, Mickleham (2), Newdigate, Ockley, Wootton. The population falling within the Union in 1831 had been 9,547 with parishes ranging in size from Newdigate (population 519) to Dorking itself (4,711). The average expenditure on poor relief for 1833-5 had been £6,767 or 12s.2d. per head of the population. The Dorking Union workhouse was erected in 1840-1 on a site at the eastern side of the Horsham Road. It was designed by William Shearburn and accommodated 250 inmates. It consisted of an entrance block at the west, with an H-shaped main building to the rear. The workhouse location and layout are shown on the 1870 map below. The entrance block was unusually stylish with a neo-Grecian design faced in white-painted stucco. Dorking entrance block from the north-west, 2001. Dorking rear of entrance block from the south-east, 2001. In the latter part of the nineteenth century, a chapel was added at the north of the site. In 1897, a competition was held for the design of a new infirmary to be built at the rear of the workhouse. Its specification included two 16-bed general wards, two 6-bed wards for dirty cases, a labour room and 3-bed lying-in ward, a 4-bed children's room, two 2-bed wards for acute cases, and two single-bed wards. The winning design was by H Percy Adams, and the building was erected in 1898-1900 at a cost of £7,366. Dorking infirmary block from the west, 1898. 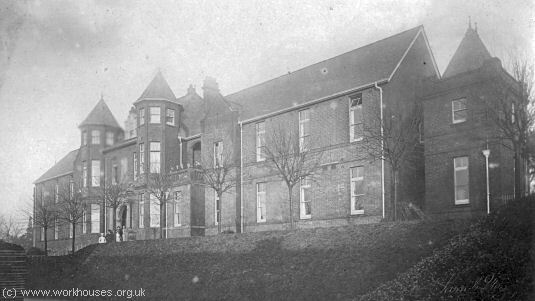 Dorking infirmary block from the south-west, date unknown. In 1930, now under the control of Surrey County Council, the workhouse became Dorking Public Assistance Institution. 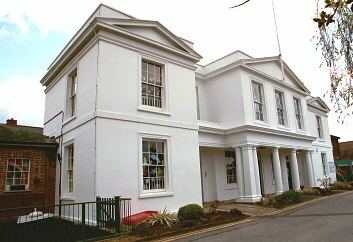 In 1936, St Anne's, a large property at Redhill, previously occupied by the Foundling Hospital, was acquired by the council to house the elderly and infirm. In October of the same year, 53 inmates were transferred to St Anne's from the Dorking Institution which then became Dorking County Hospital. The Hospital joined the NHS in 1948, subsequently becoming known as Dorking General Hospital. Only the entrance block now survives, in modern times used by a children's nursery. 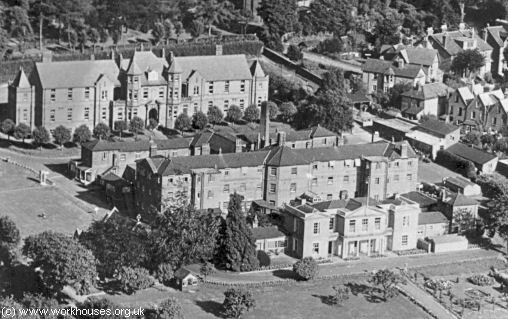 Dorking General hospital from the north-west, 1950s. Surrey History Centre, 130 Goldsworth Road, Woking, Surrey GU21 6ND. Holdings include Guardians' minutes (1836-59, 1866-1929); Births (1836-48); Deaths (1848-79); etc.